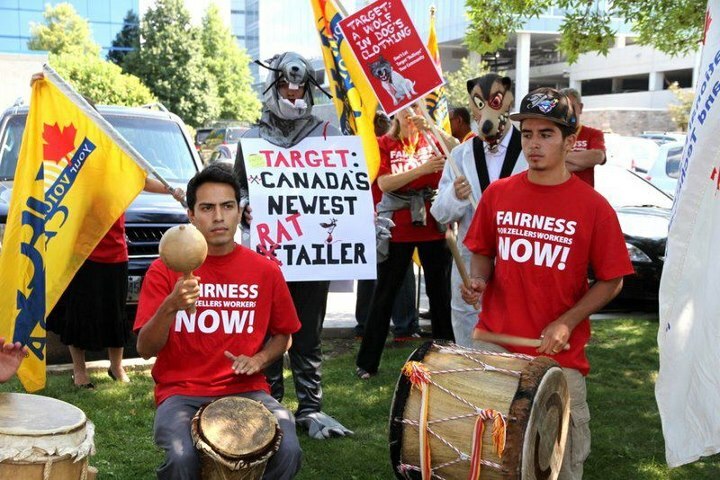 Retail workers, their family members, friends, neighbours, and allies in the labour movement held a colourful rally at the Target Canada headquarters. A diversity of workers’ organizations attended in solidarity including UFCW Canada, the Ontario Federation of Labour, the Canadian Union of Public Employees, the United Steelworkers, the Ontario Secondary School Teachers’ Federation, and the Workers’ Action Centre. This support is another promising sign of the growing retail workers’ movement in Canada. See stories in the Huffington Post, Toronto Star, and on Mississauga.com. Despite the fact that HBC sent a letter to Zellers workers asking them not to speak to the media, some workers are exercising their right to freedom of speech and sharing their personal experiences of the Target takeover and Zellers closures. See this story in the Toronto Star. It notes that Walmart acted differently when it took over Woolco stores in 1994. There are likely a number of reasons for the difference in corporate behaviour, including a perception that the Canadian government and people will tolerate such behaviour and the great number of resulting job losses now, but wouldn’t in the mid-1990s. The current Canadian government is clearly comfortable with Zellers’/HBC’s and Target’s decisions, but I believe the Canadian people still think we deserve better. Retail associates are joining with their co-workers in food production, processing, and warehousing, and together seeking improvements across Walmart workplaces. Many voices and workplaces, but a united call for change. The workers have submitted a formal ethics complaint, and you can read more about their efforts here. Zellers workers and their supporters are having a rally at the Target headquarters.